Most books get along with each other. Many age peacefully together, graying slowly as the dust collects, untroubled by the politics of the day, the threat of global warming or the pressures facing the rest of us as technology tightens its grip. Others shuffle uneasily on their shelves, demanding attention or affection. After decades of neglect Volume II of Winston Churchill’s “History of the English Speaking People” has started to emanate a discernible air of smoldering resentment. Others sit in quiet misery, unloved at inception, ignored at apogee and discarded in old age. 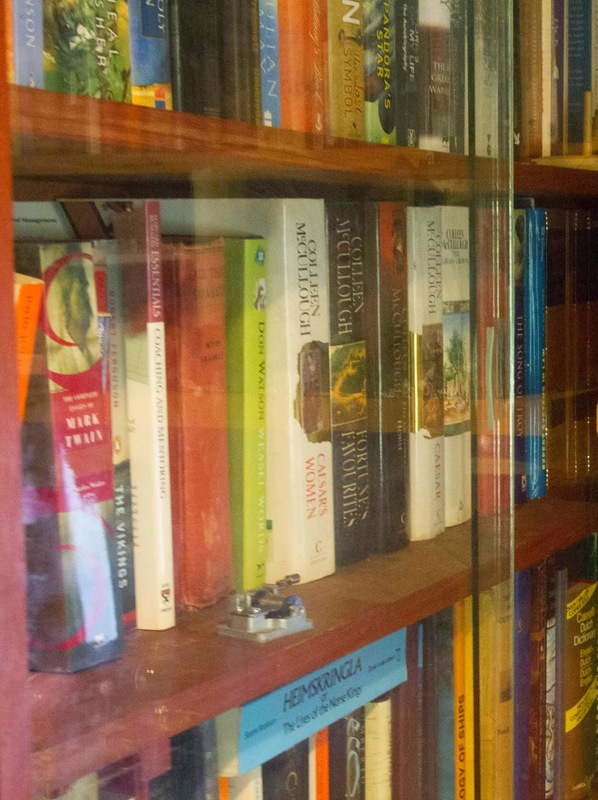 My collection of Ion Idriess and Miles Franklin sit close to me, so I can reassure them by a gentle touch of the eye, that I have not forgotten. By and large, these are commonplace problems for all of us book owners. In another time, perhaps the unloved would have been re-purposed on the floors of budgie cages or recycled through church bazaars. But we are civilized people and don’t do this sort of thing anymore. Others crackle with their own potential. They pull me back to them, time and time again, to taste the power swirling within: Snorre Sturlason’s “Heimskringla”, the “Poetic Edda”, my father’s “Rubaiyat of Omar Khayyam” (with and without Fitzgerald), the Gnostic Gospels, the “Institutes of Justinian”, Tolkien’s “Legend of Sigurd and Gudrun”, a small collection of T’ang poetry, Antoine De Saint Exupery’s “Little Prince”, Lord John Julius Norwich’s “Byzantium”, Mark Twain’s Essays and Bryce Courtenay’s “Matthew Flinders’ Cat”. And one by one back in the Closet he lays. By and large, these hold known risks for all us book owners. Touching the covers of some of these books can transport you through time and space in the blink of an eye – do you wit more, or how? Every so often, one of us does not come back. But, if you keep focused, the chances are good. These are not the troublesome books. Some of my favorite authors have described worlds with libraries that are alive with potential. Eco's medieval library in "Name of the Rose" shimmers with the potential of the undiscovered. In Pratchett's books, the library in the Unseen University is elevated to a different level... His conception is summarized: "Books contain knowledge, and knowledge equals power, which according to the laws of physics can be converted to energy and matter, so the Library contains an extremely large mass that can distort time and space." Within that library, some books of power need to be bound. I see one book glaring at me right now. I am sure Keith Windschuttle intended his “Killing of History” to be brash, outspoken and controversial. But my copy of his book has become far more. I am sure that when the lights dim, it shakes off the day's dust and starts to stalk its victims. Slowly, it is consuming the other books in my library, one by one. I have no evidence that this malice extends beyond my copy of the book – your copy may be entirely benign. Far be it for me to cast doubt on a hapless innocent book. 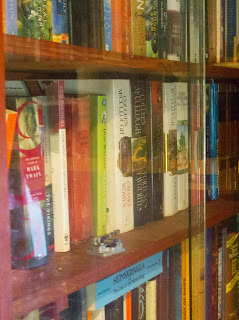 See, it is where you left it - and those gaps in your shelf - you lent those books out, didnt you? This is not the only one. I seem to have a number of these troublesome books. I am sure that they are the cause of discord late in the night - the brief sounds of a struggle followed by a sigh: not all the work of a mouser. And then there are the unexplained disappearance of lesser books and occasional paper cuts. In the past, these are the books that might have been burnt or pulped. But we are civilized people and don’t do this sort of thing anymore. I have ruled out burning, repurposing, gifting, lending, losing, throwing or reselling: each merely transfers the problem to some new unsuspecting reader or would create, in me, a burden of guilt.